An entire week of coasting downhill on neutral and huffing and puffing back uphill, and I was ready. Or I thought I was. With my father sitting pillion, I engaged the gear, and let go of the clutch. With a resounding roar, I popped a wheelie. I could hear my father shout from behind me “Bring it down! Bring it down!” but my senses were overcome with shock. With the front wheel still in mid-air, I killed the engine. I did not try to learn riding for the next two years. In high school, I owned a second-hand Hero Winner. It was already a decade old when I bought it but the previous owner, Dad’s colleague, had kept it in good condition and we got it for dirt cheap. It had ten-inch alloy wheels that I loved and despite its age, still managed to pull off 55kmph with two fat friends and me in a triple sandwich. 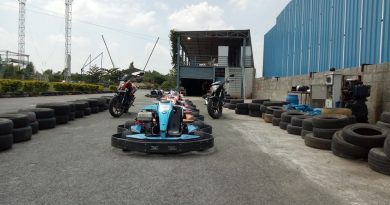 The suspension groaned and creaked but it was fun racing with classmates on Activas, Dios and Scooty Peps after school. Occasionally I would try doing a 360 on the football field or power slides by locking the rear brake. Spare parts were hard to come by and eventually we had to sell it to a local mechanic. At the same time, I learnt to ride motorcycles with my friend’s Yamaha RX135, a legend in its own right even today. My dad kept his scooter but switched to a Splendor NXG for his commute; I would take the bike out in the evenings occasionally and that is when the love of riding started. 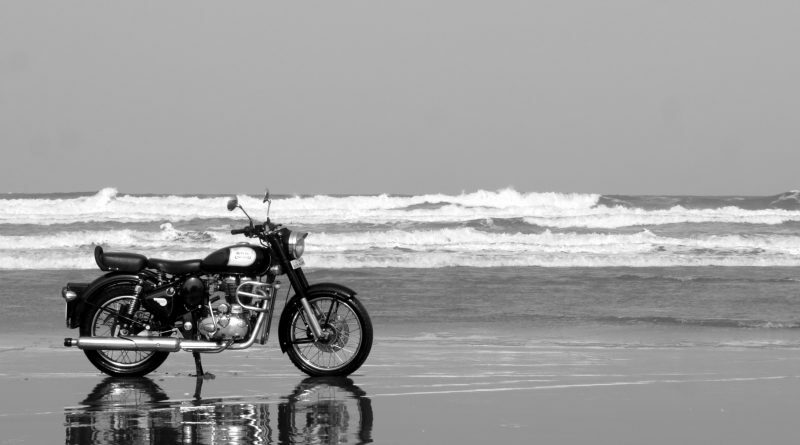 When I moved to Bangalore for higher studies, the yearning for a motorcycle grew stronger. Internet speeds were still pretty slow and like a lot of us, I spent a lot of time on xBhp. The occasional glimpse of an R1 or a Hayabusa or the slightly more common CBR 600 were enough to leave my small town self dreamy eyed for hours. It was during those days that I fell in love with Royal Enfield Bullet and I never tire of telling the story even today. I was a few feet behind a Royal Enfield Bullet when her owner, a tall, heavily muscled Sardarji started the engine. The thump and the exhaust blast from the silencer blew open the half-closed button of my shirt. The Sardarji thundered off into the distance and that was the moment I fell in love. Sometime later, Royal Enfield made its strategic turnaround by introducing the Classic twins and the Unit Construction engine and as they say, the rest is history. After reading all about their all-new engine and drooling over the gorgeous styling of the Classic, I decided that this is what I am going to get. Fast forward a few years later and after having saved up a measly amount from my pocket money (I used to joke around by saying it could buy the wheels, or a pair of mirrors) I started working and managed to save a decent amount. Consulted my parents for an auspicious date and went to book the black Royal Enfield Bullet, the Classic 350 model. Despite the showroom staff’s best attempts to convince me to go for a Thunderbird instead, my mind was set. This was what I had waited half a decade to get and this was what I was coming home with. The three and a half months waiting period that it took for me to get the bike delivered were probably one of the hardest. It was during this time that I read up as much as I could, in order to be mentally prepared. 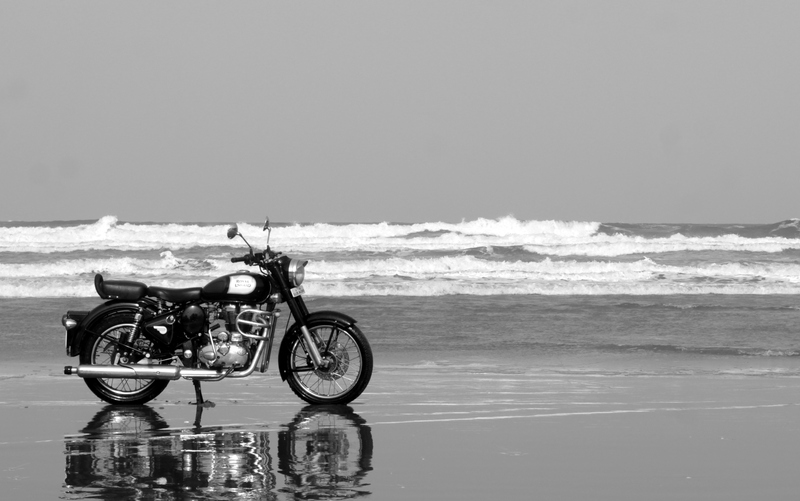 The romantic aspect of owning an Royal Enfield Bullet is often hyped upon, but the issues that the motorcycles themselves have, are very much real. Misaligned wheels, oil leaks, electrical faults, loose mountings, snappy clutch cables, poor attitude of dealers and sales staff; pathetic after sales service. All this is part of the “package”, much like an arranged marriage that you cannot walk out of easily. Then again, I guess years of waiting teach you practicality in a way blind love never can. I think at some point of time we have all seen and envied a group of Royal Enfield Bullet riders out on a Sunday ride whether in the city or on the highway; and I was yearning for my service intervals so I could finally go on a long ride without having to worry about damage to the engine during the run-in period. 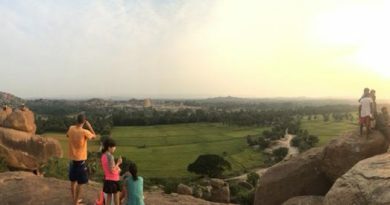 Republic Day 2016 was just around the corner and that’s when I found out about this group called Road Thrill, who were organising a ride to Ramnagara. The distance was short and perfect for my yet-inexperienced self. Little did I know that the ride would be chaos with more participation than I could imagine. And yet that was the day I was bitten by the group riding bug. 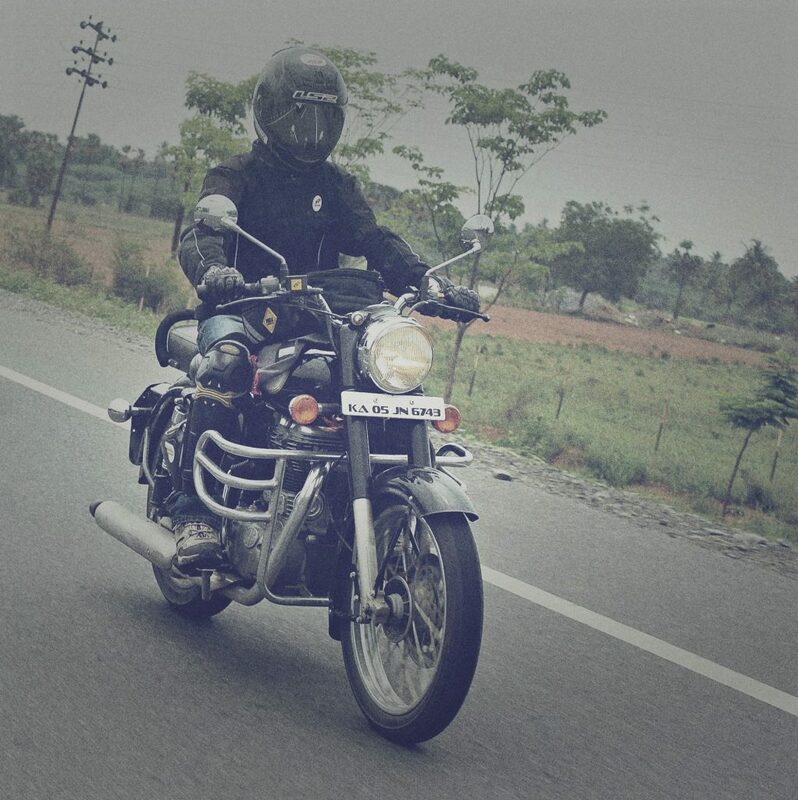 A few months later my first “proper” ride on my Royal Enfield Bullet was to Yelagiri in Tamil Nadu which is atop a hill and involves a number of steep hairpins. It was a small group ride, well coordinated, on smooth open-laned highways. I observed and learnt about formations, hand signals, safe overtaking, all of which are almost second nature by now. As we ascended the hill through the hairpins, the fragrance of eucalyptus forests made my nostrils tingle and the pressure difference made my ears pop. It was a 300-odd kilometre round trip and I was really left wanting more. A few night-outs and short rides later, I rode to Penukonda (AP) on World Motorcycling Day 2016. The weather was amazing and the company was great. 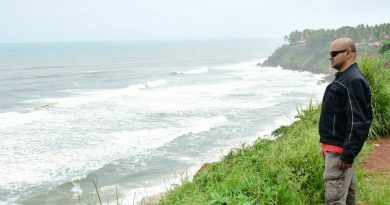 Then came Gokarna a month later which was certainly an eye-opener in terms of endurance and skill. One thousand kilometres and a hundred lessons learnt. I guess at some point of time or the other we all tend to overestimate our endurance, skill levels or are just plain overconfident and underprepared. I once attended a night-out in pouring rain without any rain gear; I was soaked to the bone even before I got to the starting point. Even before we had reached our destination I was chilled, sleepy and had delayed reactions. The return leg of the journey was just as difficult, struggling to stay awake, muscles aching for mercy. When the pit stop was called, I was literally praying for the ride to end soon. A lot of my false confidence evaporated that day, and yet Gokarna was the biggest eye opener of them all. NH4 in pouring rain, sleep, fatigue… Let’s just say I learnt overnight what my own limits were and how important it is to never go on any ride under prepared. At this point I would like to thank each and every one who has helped me become a better rider over the past 24,000 kilometres on my Royal Enfield Bullet. Rithik bhai for the ride to Yelagiri, JP for the motivation and support, Arun Hilson and Sandy for the trust, Kamal Sir for the kind words. I have met many of my friends here on Road Thrill rides; our photographer-in-residence Vinod bhai, and my partner-in-mischief, Gokool Bhai (our very own official RT Pathfinder) and Lohith bhai. Kumar Gaurav bhai, for that crazy Gokarna ride on NH4 that taught me more over a weekend than I ever learnt online. And thank you to all of you at Road Thrill, for being an overwhelming part of what I am today. You know who you are. Cheers! I firmly believe that is important to respect your motorcycle for what it is, rather than vent your frustration for what it is not. If you want your street fighter to behave like a highway cruiser, well, sorry to disappoint you. Motorcycles are made for a purpose and to try anything else on them will only wreck your engine, and possibly you too. Know your ride’s strengths and weaknesses; adapt your riding style accordingly and your bike will remain largely trouble free for years to come. For anyone that loves their motorcycle (Royal Enfield Bullet in my case), the relationship between man and machine is special. Like any relationship, there are crests and troughs, there will be times when you are disappointed with each other, or you forget to take care of each other, despite all the happy moments you were meant to share. Love often blinds you from the side of each other you are not willing to see. Yet there is a deep underlying trust between you and the machine; I believe if it had a human voice it would tell you how much it loved you back. One night, one of my colleagues complained of severe chest pain at work. It was 3am and he had to be rushed to hospital. 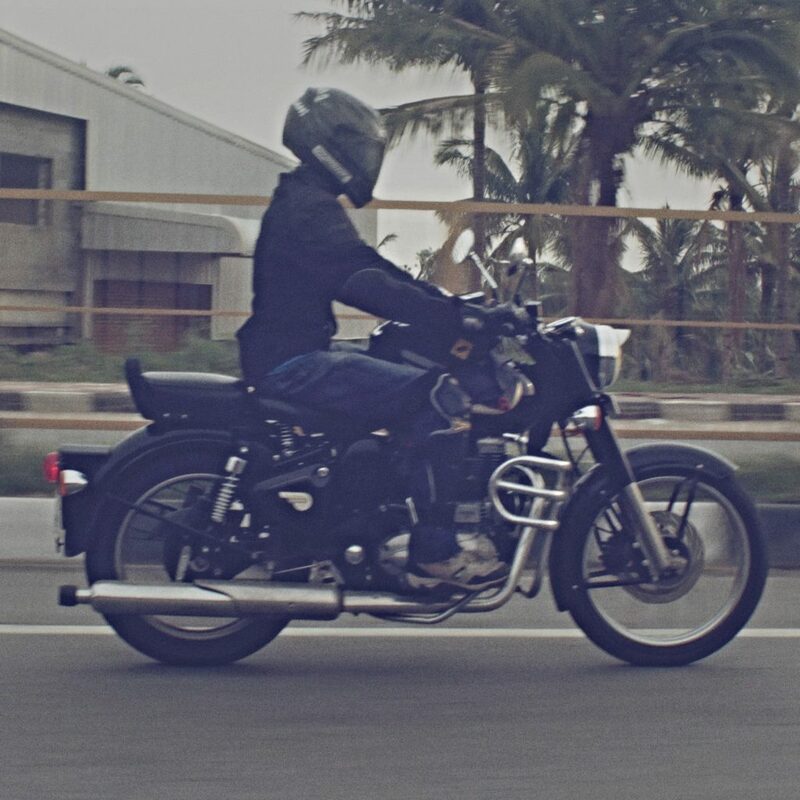 There was no four wheeler around, so I took him as pillion on my Royal Enfield Bullet. Along with two other colleagues on another bike, we reached the hospital where a quick check-up later he was out of danger. 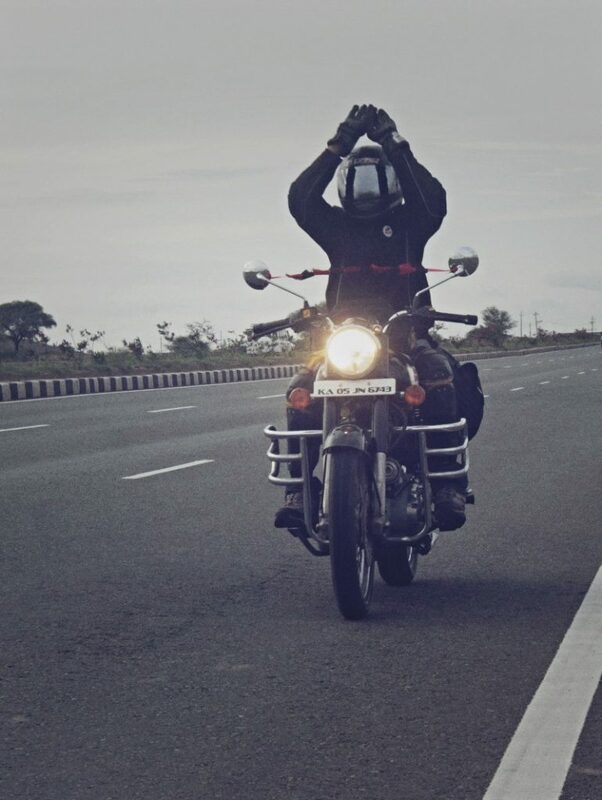 My colleague was panting, groaning and sobbing all the way to the hospital behind me, I was afraid he might fall off the bike but at the same time I could almost feel my Royal Enfield Bullet talk to me “I’m going to take you both there and bring you back safely home.” I have never felt a moment prouder than that. Or the time when it was raining hard on one of our rides and I developed a fever on the way back; I knew I would be safe on my bike; indeed I reached home safe and sound. There is a certain pleasure in periodically maintaining your bike yourself; simple things like greasing, cleaning out the spark plugs, or cleaning and oiling the chain. And then observing difference it makes on the road; the simple act of cleaning out and lubing the chain itself makes a great difference. Getting your hands a little dirty is fun, and I always recommend that every rider know at least a few basic repair skills. Someday, you will thank all those hours of practice when you are stuck a hundred kilometres from civilisation with a snapped clutch cable. When I first started to pen down my thoughts about the Royal Enfield Bullet stories, I had just crossed 20,000kms on my odometer. As of writing this now, 24,300 kilometres done, and every single one of those kilometres has taught me something, brought me joy, and helped me make many amazing new friends. A big thank you to all at Road Thrill for being such an amazing community! As my heart thumps in sync with the Royal Enfield Bullet engine, as the horizon beckons our reverberating chase, I bow my head and say a silent prayer of gratitude for the thousands of miles covered so far. May the angels watch over us as we ride the thousands more to come. Amen. A big thanks to the RT team for the photos! Very well articulated – Direct from the heart and you are blessed to have this skill, wishing you for more KM and enjoying them via your blog. Thank you for the kind words, Kamal Sir! Well written and a lovely story of your 24K KM long journey, Anirban bhai. Since I had a pleasure to ride with you, a mention of some of those rides was really refreshing. Thank you, Navneet! It has been a pleasure knowing you and riding with you! Let’s catch up again sometime! Wonderful Anirab it’s always a pleasure to ride with u guys…. Well penned Anirban .. You took me back to my good old days .. I learnt balancing by coasting downhill, then turning around and pushing the scooter back uphill, sweating and panting. I also started learning at the age of 10 to 12 in 80’s with the pigmy collectors “LUNA” and later my dad’s “Vespa 150”..
Inspiring indeed. I too do close to 200kms daily and am nearing the 24K zone. The chain assembly had to be replaced once.. I didn’t know that sagging would damage the teeth of chain gear system. Other than that I get a mileage of 50kpl as bulk of the drive is on national highway at a speed of 65-75kph with very little shifting of gears in between. Somehow, age in not on my side as I am reaching half-century mark. And I would love to die after having driven as much as possible on my Classic 350 Redditch edition.